Companies with singular products demand unique design solutions. For the last two years we’ve executed several projects for Twitter Canada and we’re really proud of the results. Since we’ve now produced a full-on body of work for them, we decided to bundle it up and use it as a case study that demonstrates how we can work with companies and brands to help them amp up their trade show and event presence, and create fun and memorable awards and giveaway items for their user and partner communities. 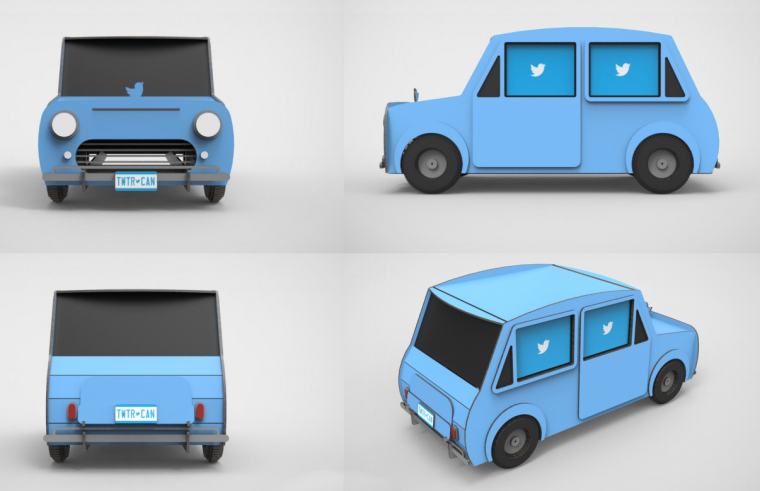 Perhaps our most playful collaboration with Twitter was the mini-car sculpture that was produced for their #VideoNow event that celebrated the rollout of video on the service in late 2015. We took their rough vision for a media kiosk that housed tablets and headphones, conceived a design with handy assembly and disassembly in mind, and realized it via lasercut plywood. Because the sculpture was assembled from flat parts, shipping was a cinch. Production was further streamlined by using digital colour printing to pre-colour the wood before lasercutting. The kiosk was fun and eye catching and attracted considerable attention—and rightly so as it was bold, colourful, and had its own fun little narrative that invited engagement. If you’re interested in learning a little more about this project, check out the blog post we wrote about it in early 2016. In 2016 designed a Twitter mirror, which was an elaborate iPad holder with a custom frame themed to match whatever event it was displayed at. These whimsical displays allowed visitors to take pictures and record live video and turned the Twitter experience into a full-on activation—attracting a crowd and generating engagement. We made several of them and, notably, we made a maple leaf version that invited users to tweet messages of support for Team Canada during the Olympic Games Rio 2016. Twitter is a cult of personality where the biggest voices capture the most attention. Being mindful to recognize the dedication of their stars, they conceived of some new awards to mark major milestones in the growth of their power users’ reach. We were tasked with designing them, and opted for wood and acrylic to underscore Twitter’s light and airy brand aesthetic with natural and understated materials. These awards were presented to @Much and @WEMovement when they cracked the million follower mark in late 2015; we also produced an award for ‘Canada’s MVT’ (Most Valuable Tweeter) that was given to everyone’s favourite #sixdad @Norm. 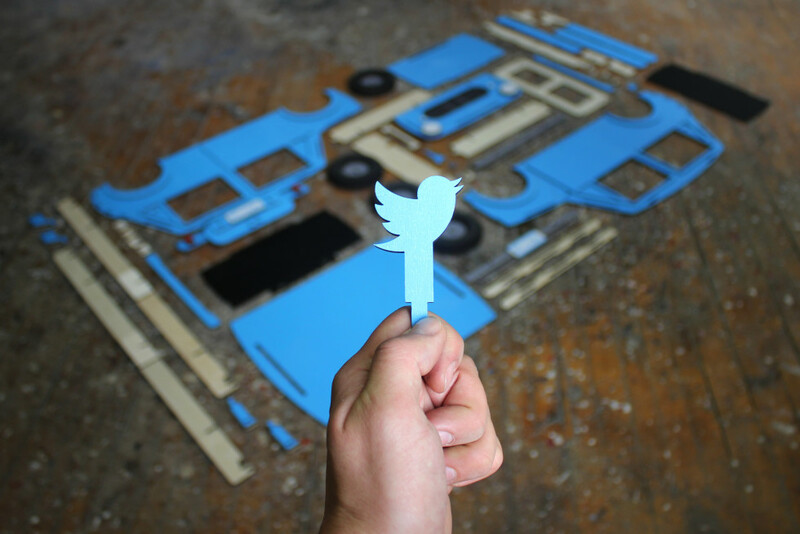 We’ve kept an open line of communication with Twitter Canada’s marketing team for two years now, and we often design and fabricate their event gifts and keepsakes. Between their team building events, corporate partner workshops, and industry gatherings, we’ve produced a range of playful and (of course!) tweetable schwag that help make their events both fun and memorable. 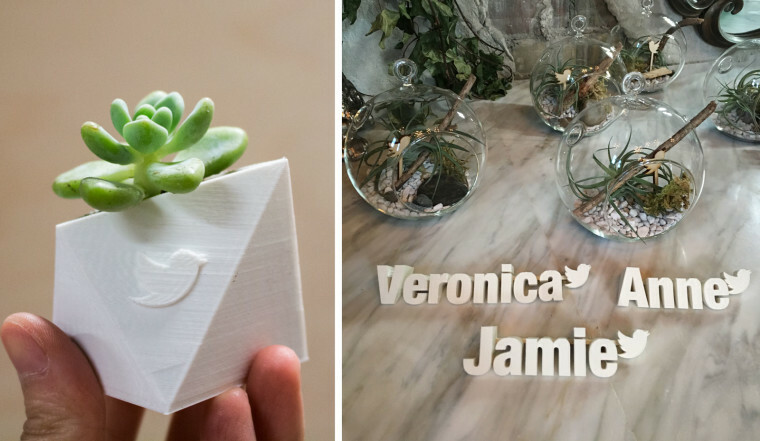 Some recent highlights: we just produced whimsical little terrariums and 3D printed name plates for their #TweettotheTop agency engagement programme; in tandem they provdied subtle branded accents for an important team dinner. Every company or brand has a different story to tell, and Twitter’s is all about the seamless and immediate sharing of concise thoughts and media. It’s been a real honour to help them ‘materialize’ some of these core attributes in IRL social spaces—we enjoy each and every design challenge that they bring us. Can we help you amp up your trade show presence and events with custom designed kiosks, signage, or gifts? Get in touch for a free quote.